I bought this so we could sit outside when the bugs were too much for us. So far, so good. Kept mosquitoes away and we've enjoyed some meals outside. 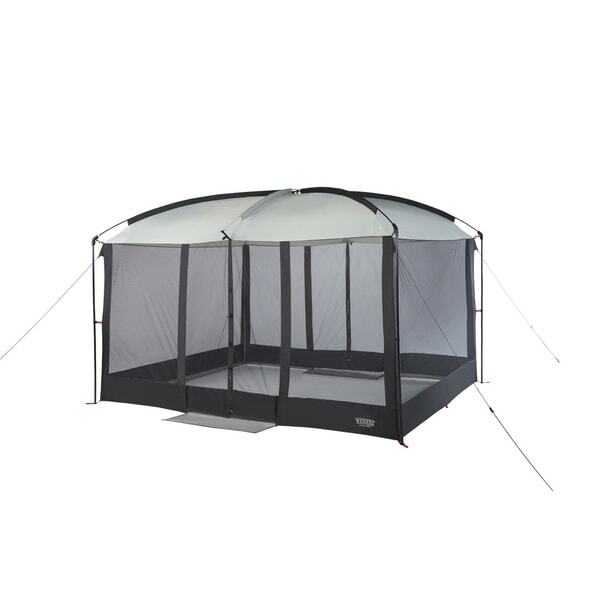 Provide a comfortable place to eat away from the rain and mosquitoes in your backyard or on camping trips with the Wenzel magnetic door screen house. Suspended from a sturdy steel and fiberglass frame, the front and back magnetic mesh door closures allow for hands-free operation while you carry your food and supplies inside. Easy to set up, take down, and clean up, this screen house arrives with a convenient storage bag for simple transportation. Weight 16 - 19.9 lbs. My yard became unbearable because of the mosquitoes in the last few years. 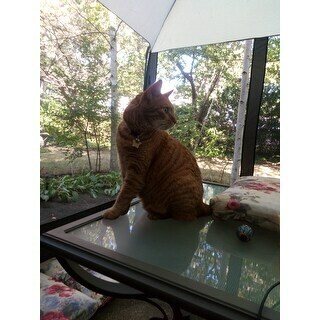 I could no longer sit at the patio table for even a minute. I figured I'd try putting this over my table this summer and see if I could enjoy outdoor leisure again. I put it up myself (55yr old woman). It was a little awkward but not difficult. The catches for the rod that goes from door to door are poorly designed. When I put the pole ends through the grommets, the end pushed against the fabric behind the grommets and started to tear it. So I pulled that fabric around the ends to avoid more damage. Those ends should have plastic brackets like everywhere else. It just fits over a standard rectangle table and chairs with no walking room unless you limit the number of chairs in there to two. My patio is concrete so I had nothing to tie it down to except the faucet bracket on the house. So I lay some 2x4s along the perimeter and tied the bottom to them for a little weight. Wish the bottom had pockets to insert lumber to hold down the bottoms as they float up a lot when you can't tie them down. It held up all summer. Had a few super windy days and it collapsed but stayed together and I just had to stand the corners again. The magnet doors work great and are super convenient for hands-fee operation. 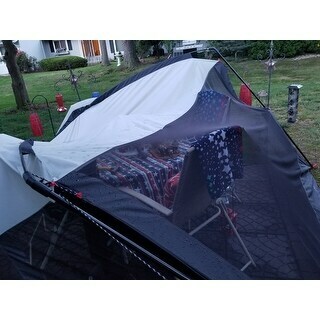 They are the reason I selected this tent. They do not seal well at the bottom. Magnets along there would solve that. I'd prefer a more flexible layout of the doors with one on the short side and one on the long i/o both on the long sides. Note the tent has no floor. The bottoms of the walls turn in for about 4" and end there. The doors have these extra flaps of plastic that extend like door mats, but they are useless imo. It was easy to take apart to pack up for the winter, however there's no way I could fold it small and tight again to fit into the tiny carry bag it comes in. I can't close the zipper. A roomier bag would be better. All in all, I'm extremely pleased with this tent. For a very modest investment I got my patio back for 3 seasons and look forward to bug-free joy next year again! I bought this to take camping with us and did just that this past weekend. We used it to keep our food and dishes in. We set up two picnic tables parallel to each other, with about 2 feet between them and it fit over both of them. The magnets were strong and closed easily by themselves whenever we went in or out. We did stake it down, but not at every stake point, and it held up great through a few wind gusts that came through. It was plenty tall and plenty wide, and easy to step into and out of. Our two 21 year olds put it up and took it down in no time flat. AND, the best of all, it went right back into the storage bag, with a little room to spare. Nothing worse than not being able to get a piece of equipment back into a bag. SOOOO very pleased with this item. Cannot wait to find another reason to use it soon. Tailgaterz Magnetic Door Screen House. Nice Screen House. Keeps the bugs away. Really great price. Would buy it all over again. Shipped with no issues. 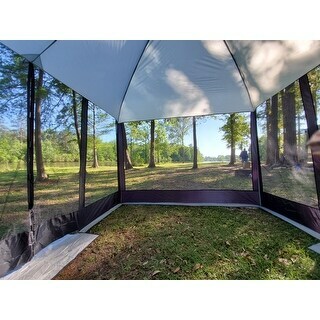 We purchased this screen house for use while camping and we love it. The magnetic door is very convenient and we were able to put a picnic table inside and still have plenty of room to move around. I had trouble getting the door screens to extend all the way to the ground, but otherwise it's a tough screen house. We had it up last weekend for a bbq and it held steady with no damage during unexpected high winds, rain and even hail. 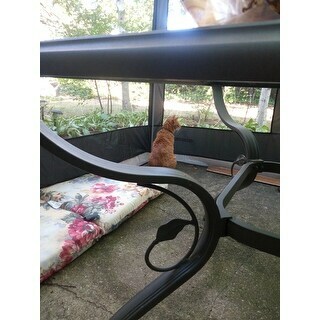 Just purchased this screen house and we love it. Super easy to put up. Love the magnetic doors, great when you're hands are full. Great for travel very easy to set up and take down. Hand's free magnetic doors are a nice feature. Plus you can't beat the price. We are going to really enjoy using this Wenzel Magnetic Screen House. It didn't take long for us to get this screen house put up and staked down. We were able to spray the inside with yard guard to get rid of any bugs that might be in there before we entered. Oh how nice it is to sit in there and see out over the lake. Love using our swing (3 man swing that we also purchased from Overstock) in there, with plenty of room to sit and chat. You can see the pictures the outside view and the view looking out. There is an opening below both doors that could potentially let in bugs, but we have used a few strong magnets at the bottom of the door and under the walkway to make this a smaller opening. We are very happy with the results. Love this. The magnetic closures are so convenient. Overall the concept of this screen house is a good idea but a few thing could be improved. I have only used my TMSH one season and ribbons that are connected to the TMSH that you tie the ground stakes line to did not hold up they all came apart therefore my tent is down. 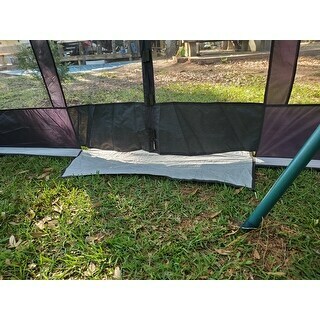 I consider that a waste of money as I expected to get more than a few months use from this tent. Love it! Easy to put up and the doors close with ease. Great for outdoors at the lake lot. Keeps bugs away from you while you sitting enjoying a drink and conversation. The magnets are so small they don't hold closed at all. Lightweight and pretty easy to setup. everything. I would definitely recommend. Flimsy and unstable, even with extra anchors, it kept falling over with the slightest breeze. The plastic support rods snapped easily. Had to put it back up almost every day until it was pointless because it was ripped in places and I had taped the plastic pieces back together.. This is Awful! You can blow and this will blow over! This is NOT what I ordered, but was sent this in place of my order! Complete Junk! DO NOT WASTE YOUR MONEY UNLESS YOU PLAN TO ONLY USE IT 1 TIME! It was just what I needed for a family reunion. "Hi, I would like to put this on the cement patio. I saw you previous answer that it would have to be weighted. What part of the structure could be weighted? Is there enough room to put weight on the corners? Will that cause an issue with The other parts of the structure? Thank you!" "Every outdoor canopy broke during heavy rain. The top weathered it, but the frame broke. Does this work through rain. I live in the north east and we get lots of rain. Its impossible to take down before every storm. Some come on suddenly"
"Is the whole unit open mesh? In the picture it looks like the side and back walls have a cover over them." It is all mesh, just a trick of the lighting in photography. I hope it helps. "How long does it take to set this up?" "Can this be put on a deck without using the ground spikes? Is it freestanding without them?" 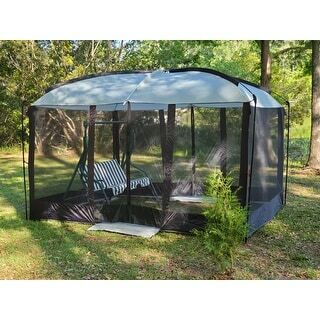 "I AM LOOKING FOR A PORTABLE MOSQUITO NETTING/CANOPY FOR MY DECK THAT I CAN PACK UP AND PUT AWAY IN THE WINTER ANY SUGGESTIONS"
This appears to be in that category. "what are the dimension of this screen house?" This house is approximately 11 feet long x 9 feet wide.